The generator controller GC2000 provides efficient and reliable controls for gensets in a wide range of marine power applications, installed in commercial ships, tugboats, fishing vessels, crewboats, yachts and naval vessels etc. 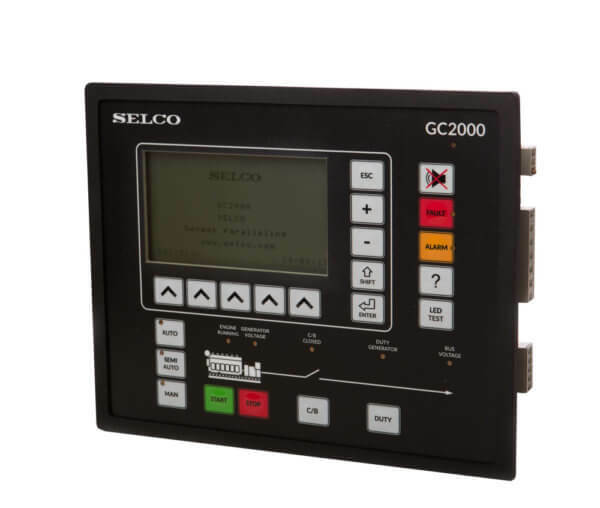 SELCO’s GC2000 provides efficient and reliable controls for gensets in a wide range of marine power applications, installed in commercial ships, tugboats, fishing vessels, crewboats, yachts and naval vessels etc. The GC2000 features a complete engine-generator control and protection system, and includes an extensive range of functions for engine control & monitoring, synchronizing, load-sharing, load depending start and stop and complete generator protection. The GC2000 is designed to fit a wide range of applications, from basic genset control and monitoring applications to advanced and more complex power management solutions including combinations of shaft generators, bus tie breakers and shore power connections.